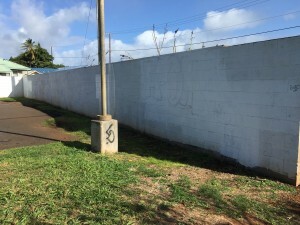 808 URBAN completed its first mural project on Maui—Pā‘ia Mural Project—in the town’s Municipal Parking Lot on Hāna Highway at the end of February 2016. 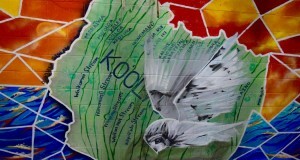 The mural was painted on a 84-foot-long by 7-foot high wall that delineates one side of the lot. Before: Pā‘ia Municipal Parking Lot on Hāna Highway. The focus of the project is the rich history of the North Shore as told by the community’s elders. Artist John “Prime” Hina and his hui of O‘ahu artists from 808 URBAN assisted students from the Pā‘ia Youth and Cultural Center, Kamehameha School, Seabury Hall, Carden Academy, Haleakalā Waldorf School, King Kekaulike High School and the Maui community in creating the mural. 808 URBAN, a Hawaiian nonprofit arts organization, is a collective of community of artists, organizers and volunteers committed to improving the quality of life for our communities through arts programming. 808 URBAN strives to integrate the highest levels of artistic innovation with grassroots cultural organizing for systemic, progressive social change. Prime has developed an effective way of steering youth from the dangers inherent in growing up in at-risk neighborhoods, transforming them into community-minded artists and cultural workers. Pā‘ia Mural Project. 808 URBAN photo. 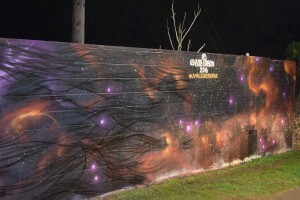 His unique method of youth development is rooted in the art of graffiti muralism, a visual vocabulary of the streets that he has harnessed as a cultural tool for positive social change. 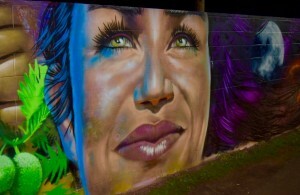 Prime has created over 50 public murals and coordinated numerous public arts events on O‘ahu in the past eight years. 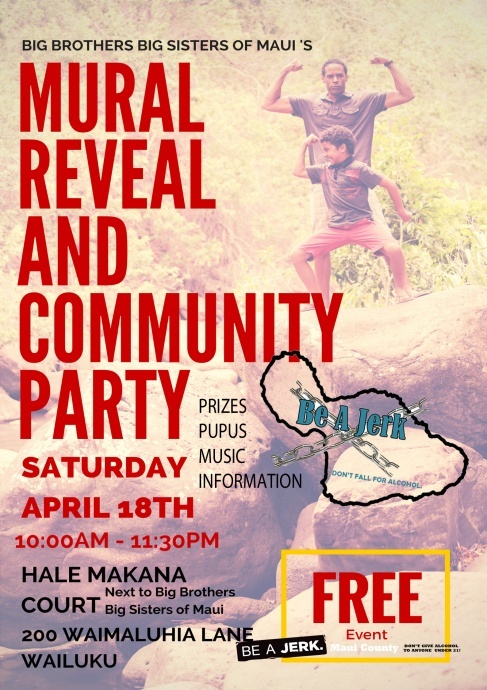 “In this chapter of 808 Urban’s Living Legacy Series, we explored East Maui in three specific moku or districts—Hamakua Poko, Hamakua Loa and Ko‘olau,” Prime explained. From right to left, the mural includes the constellation called “Ka Makau Nui o Maui” (“The big fishhook of Māui”) or Manaiakalani. Prime continued, “From the mouth of Kū flow the fresh water of Kāne. A representation of the abundance of water that once flowed throughout Maui. “The water flows right into a kaleidoscope of waterfalls representing the 12 moku (districts) of Maui,” Prime explained. “In the early days, everyone knew everything about their place and where they came from. Without this water source, everything and everyone living in it become lost. Maui is also witness to the migration of the koholā. “It is said that each pod carries a certain song that is taught to the young calves and on their journey back, the calves add their own sound to the original composition,” said Prime. “It is very similar to the way Hawaiians celebrated their geneology and added the names of the newborns in oli (chants) and mele (song). In the next scene, Hina presents herself in the form of the coral. “Moving over to the front wall we open up this next scene with the lehua blossom, which can still be found in the area and still live on in the street names and songs pertaining to Maui,” said Prime. “… a humble symbol of our perseverance as a community to overcome our challenges, and to live in harmony with this place we call home. Continuing on to the “temple” of the sun with a background that is reminiscent of stained glass artwork, the artists honored the place names of the three moku—Hamakuapoko, Hamakuapoko, and Ko‘olau. 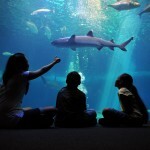 “There are many stories pertaining to Kamapuaʻa (the pig god) in these areas, which is represented by his other form, the humuhumunukunukuapuaʻa or trigger fish,” said Prime. The mural ends to the far left with the image of Kanaloa, the guardian of the ocean, in the form of the heʻe, the octopus, also known as the brother of Kāne. “It is our hope that our children can come to this place and learn about some of the beautiful history of Maui, but more importantly, the deeper values and wisdom that are contained in each moʻolelo—story,” Prime said. “A big mahalo to the many that have come together to ‘build’ this mural with their hands and have infused their mana, leaving a legacy for future generations to learn from,” Prime concluded. 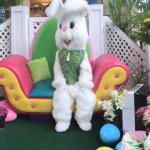 For more information, contact Angela Cochran at (808) 283-6813 or via email.